At first glance, The Lottery Office looks like a decent lottery site – but the flaws outweigh the few things it does manage to get right. It’s a shame too, because I thought it really held promise the first time I landed on their website. They feature big games from Europe and Australia, offer great security measures, collect winnings on your behalf, and offer a slew of enticing promotions. All good so far, right? But, if you dig a little deeper you’ll see that their game offerings and banking options are incredibly limited, for starters. They also don’t offer a subscription option, nor can non-English speakers browse the site easily due to lack of multi-language options. More importantly, they retain ownership and all the rights to the tickets that you purchase from them, so don’t expect them to send a copy to you any time soon. So, yeah – needless to say, this one was a disappointment. What is The Lottery Office? 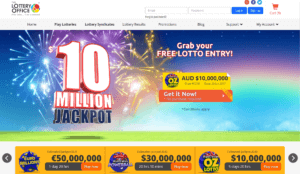 More than a decade ago, The Lottery Office’s parent company, Global Players Network Pty Ltd, was granted a license to promote Australian lottery internationally through mail order. Fast forward to 2014, the Northern Territory Government of Australia granted them an Online Gaming License, which prompted the birth of The Lottery Office that we now know today. Over the years, they have paid over 759,650 winners – which include 7 jackpot winners. How does The Lottery Office work? To play lottery with The Lottery Office, you just have to buy tickets with a registered account. It’s easy – and you even have the option to quickly buy tickets if you want. Log in to your The Lottery Office account. Choose from the available lotteries, and click on the “Play Now” button to proceed. Express Checkout: Numbers are automatically chosen for you, so all you need to do is choose how many lines you want to play, and how many draws you wish to participate in. Choose Numbers: This is the traditional way of playing online lottery where you choose your numbers manually or via a Quick Pick option. The Lottery Office also lets you choose the game type and customize the number of lines, on top of choosing how many draws you wish to participate in. Once you are satisfied with your order, click on the orange “Add to Cart” button. Review your order and click on the orange “Purchase” button once you are done. It’s disappointing that The Lottery Office only offers 6 games – but it’s more disappointing that the game selection is rather lackluster. In addition to the 6 games offered, the Australian Saturday Lotto also holds a Superdraw version of their game around 6-7 times per year, so you may see the number of games at The Lottery Office rise to 7 from time to time. The Lottery Office also offers group play games, but they are extremely limited. Their Combo Syndicate is a pretty good deal. Here’s a bit of good news: one of the syndicates they offer is a bundle. This means that you get to participate in 3 different group play lotteries for one purchase. The Aussie Combo Syndicate gives you the opportunity to play 8 lines in Australian Powerball, 5 lines in Australian Oz Lotto and 8 lines in Australian Saturday Lotto for a total of 21 lines. They also offer a group play option for Euromillions, which gives you 6 chances to win per share. This is where The Lottery Office shines. Free Entry Upon signing up and confirming your email address, The Lottery Office automatically gives you a free entry to an Oz Lotto mini-syndicate. First Purchase 100% Refund Upon your first purchase, The Lottery Office will credit 100% of its value back to your account. You are then free to use it for an additional entry. Double Your Dollars If you win and decide to reinvest your winnings on more tickets, you stand to gain a 100% bonus. Vouchers The Lottery Office’s vouchers allow you to get discounts or even a free entry. Refer a Friend For every friend you successfully refer, you will receive $20. The more you refer, the more bonus money you can receive. Win a Free Trip to Australia If you win the jackpot of at least $1 million, The Lottery Office will throw in a free trip to Australia for two. It includes a 6-day, 5-night stay at a 5- star hotel and business class flight accommodations. Is The Lottery Office safe? One of the things The Lottery Office gets right is security. For starters, their website is secured by Thawte EV SSL, which is capable of up to 256-bit encryption, to ensure that data going to and from the website is encrypted. Beyond that, The Lottery Office is also duly licensed and regulated by the Northern Territory Government of Australia, which means they abide by strict gambling codes of practice. Claiming prizes is made easy by The Lottery Office. Like many lottery sites out there, winners of prizes under $10,000 are automatically notified by email, while those who win prizes that go beyond the threshold (i.e. jackpots) are notified via phone. Unlike other lottery sites, however, you won’t have to travel to Europe or Australia to claim your prize in person – The Lottery Office takes care of that for you. That said, it’s not immediately clear on their website how jackpot wins will be sent to you, though they do say that they will contact you to discuss the process. Secondary wins, however, will be automatically transferred to your account. The Lottery Office disappoints with their accepted banking methods. They currently accept a total of 5 different deposit methods and 3 withdrawal methods, so if you are using a payment method other than the ones they support, it’s better to go to a lottery site that can cater to you right out of the gate. I you need to contact The Lottery Office support agents, you can only do so via email, phone or snail mail – no live chat options here. Worse, their phone number is a local Australia number, so international players are stuck with email if they don’t want to incur additional expenses. As for snail mail? That’s hardly a viable option for immediate concerns. If self-help measures are all you need, then The Lottery Office delivers in spades. Their FAQ section is one of the most comprehensive ones I have encountered so far. They provide numerous articles on topics like Getting Started, Promotions, Managing my Account, Finance, Entries and Transactions, and more. Almost everything you need to know about The Lottery Office’s services can be found in their FAQs. The Lottery Office’s education materials are pretty impressive. Their How to Play guide even includes an interactive number picker. Like most lottery sites, they provide nuggets of helpful information for each of the games they offer. Each individual lottery page contains the rules for each game, the history, and even an interactive number picker that lets you see for yourself how each game functions. Beyond that, they also provide an in-depth glossary page that details most of the important lottery terminologies that you need to understand before playing. In short, newcomers should have no problems at all easing in to the lottery experience. One of The Lottery Office’s strongest suits is their website’s ease of use. Their website is pretty easy on the eyes and a breeze to use. There’s really nothing new here though, what you get looks and feels like what you would see in other lottery sites. And that’s not a bad thing – The Lottery Office’s site is quite minimalistic and a breeze to navigate as a result. The persistent menu bar, for instance, gives you quick access to all the important pages of the website: lotteries, syndicates, lottery results, promotions, support, your account and more. Strangely enough, The Lottery Office’s limited offerings do them a favor in this regard since you won’t have to dig deep to get to everything. Final Thoughts – Should You Use The Lottery Office? 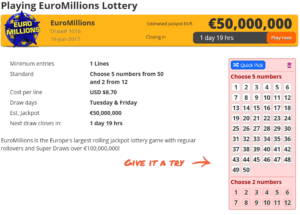 Unless you only want to play in European and Australian lotteries, give this one a pass. Make no mistake, there are several things that I really liked about The Lottery Office. The solid security measures and the fact that they are licensed and regulated by the government of Australia at least ensure that your money is in safe hands. I also really liked the various promotions that they offer (who wouldn’t like discounts or a possible free trip to Australia?). On the other hand, while it’s great that you can play in some well-known games from Europe and Australia, the limited amount and scope of their selection leaves much to be desired. The few banking methods they accept, meanwhile, create roadblocks for some players. Similarly, the lack of multi-language options alienates those who don’t understand English well. Beyond that, what’s most disappointing is the fact that The Lottery Office does not recognize its players as the rightful owners of tickets purchased through their service. They have certain checks in place that keep them from spiriting your winnings away, but it’s still a bit off. Who wants to purchase lottery tickets that they would have zero ownership of? You’d be better off looking elsewhere for your lottery fix.